To / From Airport: Transfers at extra costs. The day is yours to explore Remich—the Pearl of the Moselle—with panoramic views of surrounding forests and vineyards. Enjoy dinner on board this evening. Join a Guided Tour of Luxembourg City—with its dramatic views, ancient ruins, and modern architecture along the deep gorge terrain. Join your Avalon Adventure Host for a hike to nearby castle ruins. Spend some free time at your leisure this afternoon—hike to view the vast vineyard landscapes, bike through the Renaissance-style village, or relax with a glass of German wine. Join a Guided Walk of Cochem to see the charming town’s half-timbered houses and winding streets. Visit Cochem’s hilltop Reichsburg Castle with a bird’s-eye-view of the Moselle Valley and river bend. Later, relax on the Sky Deck while sailing through the magnificent Rhine Gorge. Join a Guided Walking Tour of Cologne’s important Jewish heritage sites. Spend free time exploring the colorful streets, bridges, and canals of Amsterdam—with its many cafés and art galleries. 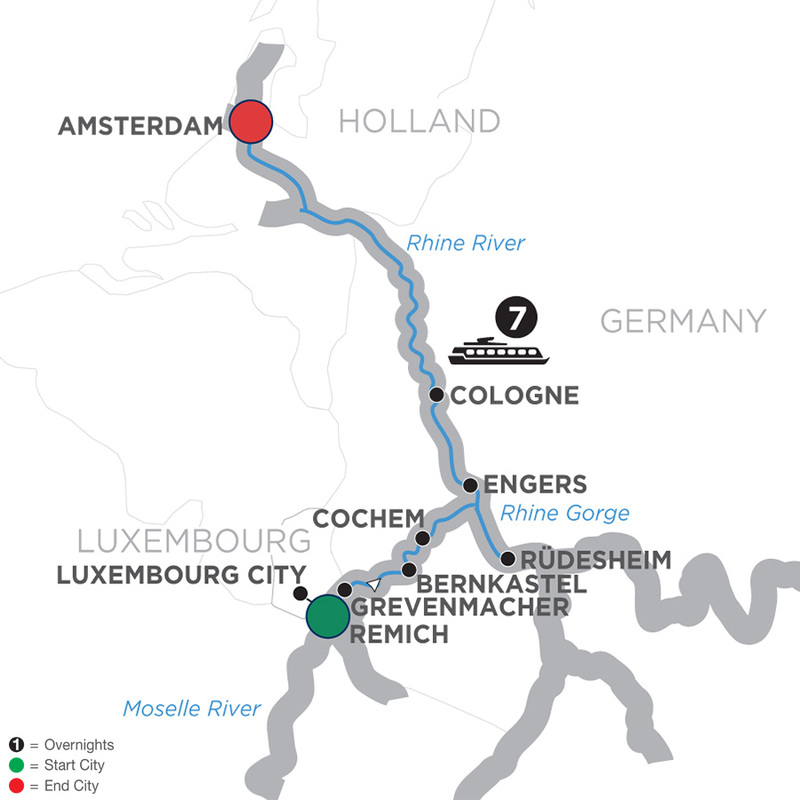 This morning, relax on the Sky Deck while sailing through the magnificent Rhine Gorge.